A GIST cancer diagnosis is a devastating experience no matter what age you are. For many of us our first ray of hope has been to make contact with GIST patients manning the GIST Support UK helpline 0300 400 0000. They can talk first hand of their own experiences and provide invaluable insight where others may not ba able to help. 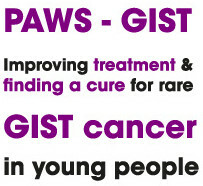 GIST Support UK has championed the set-up of PAWS-GIST and is an Alliance partner. As a result we are gradually facilitating introductions of PAWS-GIST patients to others who are experiencing the same. Our sole purpose is to provide support and improve the health and wellbeing of GIST patients and we welcome you to make contact with us to help us help you and the whole of the GIST population including PAWS-GIST. Requesting a referral to the PAWS-GIST clinic. Raising funds to support and sustain the PAWS-GIST clinic & research fund.